Epilepsy is a common chronic neurological disorder characterised by recurrent unprovoked seizures, and affects 50 million people worldwide. Approximately 30% of these do not have seizure control even with the best available medications, hence renewed and increasing interest in the use of dietary treatments to treat epilepsy. These treatments include the traditional ketogenic diets but also the newer modified Atkins diet and low glycaemic index treatment. The ketogenic diet is a high-fat, adequate-protein, low-carbohydrate diet that in medicine is used primarily to treat refractory epilepsy in children, and requires the dedicated support of a multi-disciplinary team including doctors and dietitians. 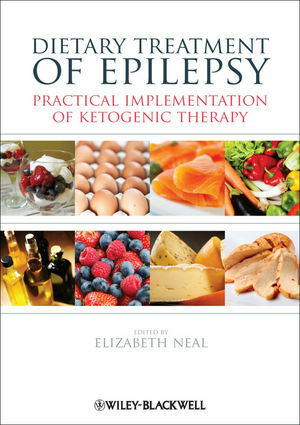 Dietary Treatment of Epilepsy: Practical Implementation of Ketogenic Therapy provides comprehensive and practical training on all aspects of implementing and managing dietary treatments for epilepsy, with key chapters on assessment, calculations, implementation, monitoring and complications. Edited by a highly respected expert in the field supported by a strong team of contributors, this is a must-have resource for paediatric dietitians and other members of the therapy team. Elizabeth Neal has both clinical and research experience in the dietary treatment of epilepsy, with a PhD in ketogenic diets. She is based at the Institute of Child Health in London, and Matthew’s Friends charity and clinics.